dullness. These essential ingredients can be applied topically to skin, but more interestingly they can increasingly be ingested to provide our bodies with the helping hand they need to perform more effectively – therefore having a positive impact on the overall appearance of our skin. , stimulate skin microcirculation and aid collagen synthesis; based on scientific excellence, the products also contain an array of natural plant extracts, essential oils and naturally occurring vitamins from around the world with high quality research and development underpinning the effectiveness of the range. Although the Anti-Gravity Regenerating Serum (featuring micro-collagen peptides to stimulate collagen production and boost elastin synthesis, as well as nano-vitamins that allow the collagen to be absorbed more effectively) and Super Antioxidant Moisturiser (infused with nano-vitamins, grape seed oil and green tea to help defend against free radical damage and photo-ageing) are both incredibly pleasant to use, and are clinically proven to help restore the fullness and glow of skin, it’s the supplements that I’m really interested in. 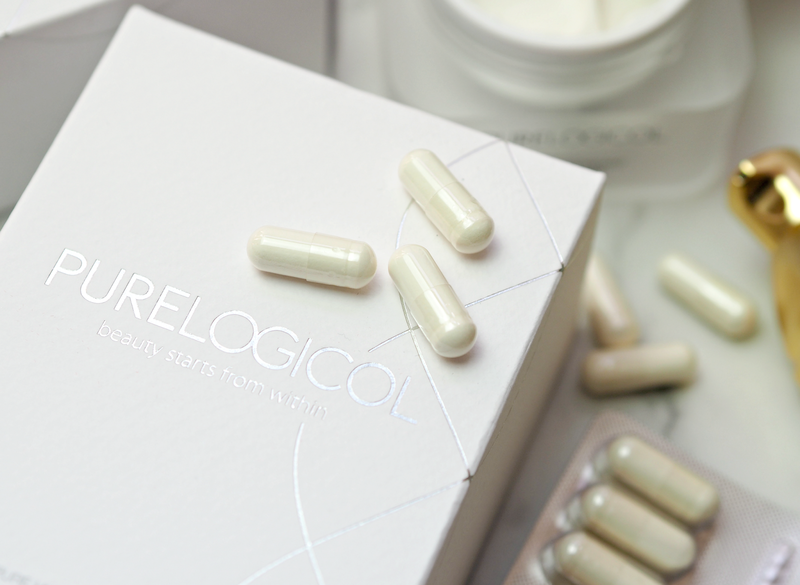 The Purelogicol Collagen Peptide Skin Supplements (£39.00 for 90 capsules) feature a unique enzymatic process which breaks down the collagen’s molecular weight for better absorption into the body – which in turn helps to stimulate collagen production internally. 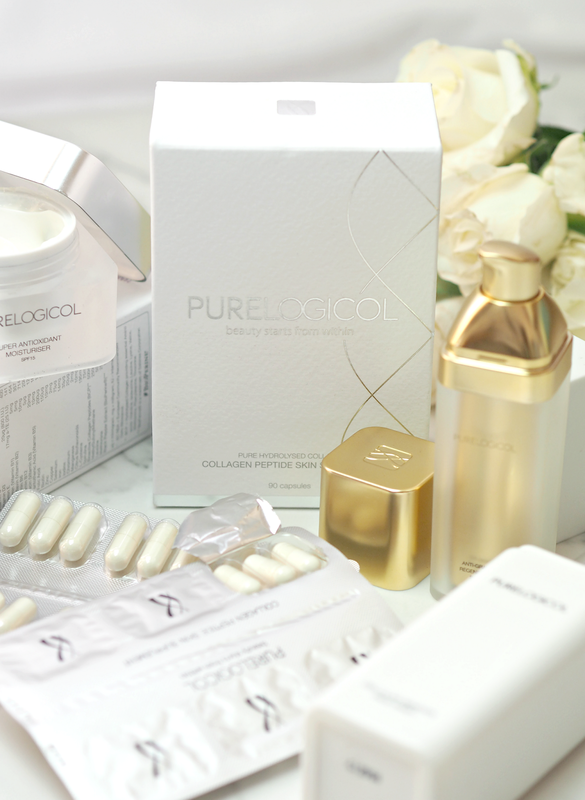 The debate surrounding collagen absorption (both internally and externally) has been focused on the size of the molecules, but Purelogicol have discovered a way to ensure their collagen is broken down and absorbed by the body thoroughly for maximum impact. In clinical trials* the supplements have been proven to offer a 43.3% reduction in wrinkle width, 25.8% increase in skin moisture and 34.5% decrease in pore size over six weeks – when capsules are consumed daily before bed. Those are stats you can’t really argue with. Ingestibles have already started to see a surge in popularity with our overall focus shifting towards wellbeing and healthy eating (superfoods, yoga and mindfulness have never been so popular!) and this is just another way that I anticipate us collectively adopting a new way of looking after ourselves. Multivitamins have never really been proven to offer any real benefit, so swapping them for a targeted supplement that has supporting scientific evidence behind it is a worthwhile investment. With so many launches hitting the shelves of beauty stores over the next six months, it’s no wonder that even high street retailers are moving some of their beauty supplements into their skincare aisles; just as ten years ago we struggled to get to grips with a serum, I’ve no doubt that in ten years time we’ll all be popping out our skincare pills rather than lathering on eight layers of product. I’m putting these to the test right now and can’t wait to see the results over the next three months or so. At £39.00 for a month’s supply, it’s a definite investment in your skin for the long term and not a solution with immediate results, but it’s been proven to help counteract the impact of ageing and that’s something I can absolutely get on-board with. 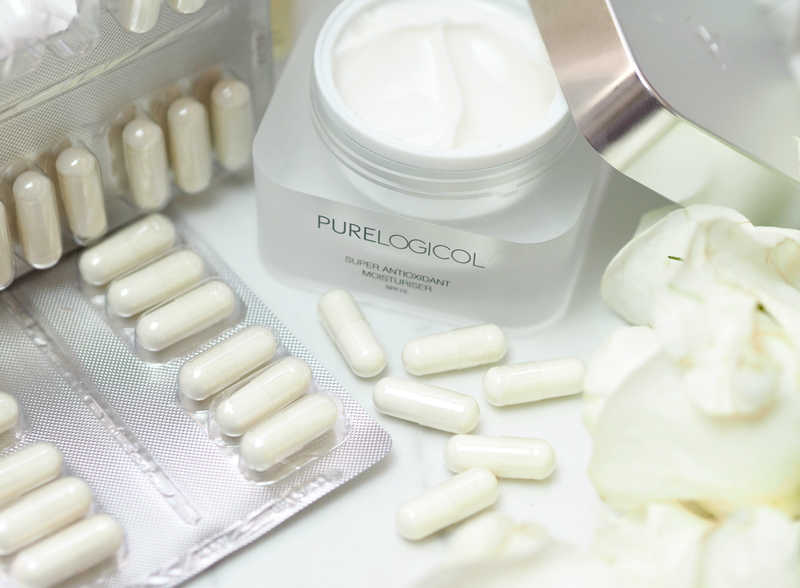 *These findings are based on a six week Independent, clinical trial of the Purelogicol Collagen Supplement. The placebo-controlled, double-blind trials were conducted at the University of Pretoria in South Africa. Read the report of the clinical trials here. The 100 participants were aged 50-65 and took four supplements a night for a period of six weeks. This is a sponsored post on behalf of PPurelogicol; all opinions my own. Hey there, I am really interested…have you seen results? I definitely did in certain areas of my face. I stopped taking a few months ago when I ran out though.